This is the essence of what we call "Shaping Possibilities". Formglas works with architects and designers to understand their design vision and help bring concepts to reality. Our design engineers or project managers will discuss variousmaterial technologies and installation approaches. They may sketch details or might even have a 3D model generated to validate a complex design approach. The Formglas R&D team may be called upon to produce custom material samples. Formglas material is then specified in the project, or we are deemed to be an approved manufacturer. Upon receipt of project drawings and scope details, our team of project estimators will prepare a detailed quote outlining quantities and any available options including value-engineering opportunities. 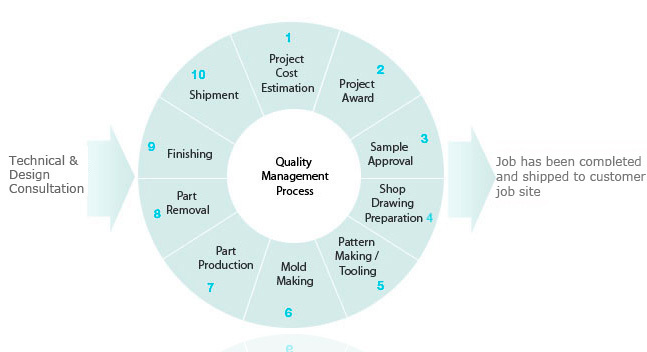 A general manufacturing lead time estimate will be provided. Commercial terms, scope, and delivery times are reviewed and finalized. Samples are typically prepared for color and texture at the project specification stage or after the project is awarded and are signed off by the architect. Production will not begin until sample approval is obtained or waived. Detailed shop drawings providing part dimensions and installation details are prepared using AutoCAD. Appropriate engineering stamps (if applicable) are obtained, and the drawings are approved by the customer before production begins. Where existing samples are not available, most new patterns are manufactured by 5-axis CNC machines to ensure accurate dimensions, crisp details, and rapid production. Where ornate details or the appearance of aging is required, Formglas' experienced team of sculptors will produce the pattern. Most patterns are =machined on furniture grade MDF, or are produced using clay, plaster foam or metal. All completed patterns go through a quality control process to ensure dimensional accuracy. Using the pattern as a positive or "plug", a negative mold is produced to form the cavity into which GRG, FRP or GFRC materials is applied. A range of composite materials may be used in the production of molds to ensure the appropriate balance between dimensional stability, durability, detail reproduction, cost effectiveness and production efficiency. Again, quality control processes are deployed to ensure that the final mold meets approved specifications. Part production, depending on the type of material, is carried out by a multi-step hand or spray lay-up process. Raw materials used may be a gypsum, cement or polyester resin matrix. The matrix (depending on which raw material used) may contain pigments, aggregates and polymers for aesthetics and long-term durability; and part reinforcement is achieved with glass fiber, foam core, wood, steel or plastic (depending on the material and fastening details). Ultimately, a high-strength, lightweight and thin profile is created to meet the architect's specifications and to match approved shop drawings. After curing in the mold, the part is removed from the mold and further cured until ready for finishing. Undercuts or intricate sections are accommodated by the use of flexible versus typical rigid mold making materials. Depending on the type of material produced (GRG, FRP or GFRC), the part may go through a secondary process of finishing to achieve the desired surface texture or finish. Detailed quality control and touch ups may be performed to ensure the finest quality finished product. All parts are shipped protected either crated or uncrated (depending on the size). Formglas has decades of experience shipping locally, domestically and overseas, and will utilize the most appropriate packaging techniques to ensure that parts arrive in factory condition.